Posted on May 4, 2018 at 6:26 am. We begin today with WOLF PACK PRIDE!! Thanks to all the students and staff who got into the spirit of Spirit Week and dressed-up for Star Wars Day. You’re looking good, Williamsburg! Now let’s keep this great school spirit going all year long — and Be a Part of the Pride!! And now as part of Spirit Week and our “Stress Less, Laugh More” initiative, we’d like to welcome a pair of special guests to the WOLF-TV Studio. Say “hello” to Mr. Caldwell and Ms. Zeller! ZELLER: Good Morning Wolves! I’m Ms. Zeller. CALDWELL: And I’m Mr. Caldwell, and we’re here representing the Student Services Staff with today’s Mindful Moment. ZELLER: All week long, we’ve been focusing on the importance of “Stressing Less” — and providing you with strategies to reduce your anxiety when times get tough. CALDWELL: But today, we’d like to change the focus a bit — we’re going to talk about LAUGHTER! ZELLER: That’s right — “laughter” can be a POWERFUL force when it comes to reducing stress and supporting your overall mental health. CALDWELL: Unfortunately, laughter does not cure all of our problems, but it does have both short and long term benefits. ZELLER: A good laugh can kick-start your “stress response”, and has been proven to reduce your heart rate and lower your blood pressure. CALDWELL: A hearty guffaw can also reduce tension by improving your circulation and increasing muscle relaxation. ZELLER: A rollicking chuckle can also strengthen the immune system, relieve pain and improve your mood. CALDWELL: Long story short — it’s actually GOOD for you to LAUGH!! So let’s celebrate the benefits of laughter… with a couple of Star Wars Day JOKES! ZELLER: What did the cow say to the Jedi? CALDWELL: I don’t know, what did the cow say to the Jedi? CALDWELL: Why did Anakin Skywalker cross the road? ZELLER: I don’t know, why did Anikin Skywalker cross the road? CALDWELL: To get to the Dark Side! ZELLER: It’s funny because it’s TRUE! Well, that’s it for today’s Mindful Moment. Thanks for joining us all week long for the “Stress Less, Laugh More” initiative. I hope it helps in the weeks to come. CALDWELL: And remember, if you ever are feeling stressed or overwhelmed — or even if you just want to talk — we and the entire Student Services Staff are here for YOU. ZELLER: Happy May the Fourth, wolves, and Be a Part of the Pride!! Thanks for that Mindful Moment Mr. Caldwell and Ms. Zeller. You two are HILARIOUS. And now for more WOLF PACK PRIDE — The WMS Track Team SHOCKED THE WORLD yesterday — taking FIRST PLACE in the County Championship Track Meet. The team absolutely dominated the competition, winning by a combined 65 points. But that’s not all — special recognition goes to Mr. Peacock’s 6th grade TA for raising the most money in the school. They contributed over 600-dollars to the fundraiser Congratulations, Peacock, you just won a pizza and ice cream party for your whole TA! Ms. Kia will contact you soon with more details. Thanks again to everyone for supporting the Pennies for Patients fundraiser. You’ve all made a difference in the fight against cancer. Up next, there are a lot of AMAZING students here at WMS. And you deserve to be recognized! Teachers from every grade and every team have identified a distinguished group of students to receive this month’s Wolves With Character Award — for demonstrating outstanding COOPERATION with their peers. Take a look at the screen, to see the deserving honorees. In 6th grade — Ellie G., Gary U., Lea B., Michael D., Sydney K., Eric N., Nora W., David M., and Anjila B. 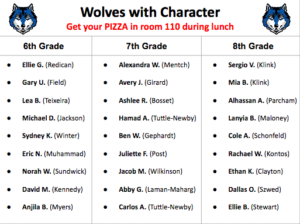 In 7th grade — Alexandra W., Avery J., Ashlee R., Hamad A., Ben W., Juliette F., Jacob M., Abby G., and Carlos A.
Congratulations, wolves with character! Be sure to stop by room 110 during your grade-level lunch and pick up your free pizza! And now an IMPORTANT ANNOUNCEMENT for all 6th graders — There will be a special presentation for all 6th graders during WOLF TIME this morning. You’ll be exploring the school’s NAVIANCE program — a Career Survey that introduces you to numerous careers you might like to try when you grow up. So get your iPads ready! The presentation begins promptly at 8:05 this morning on WOLF-TV. And finally today, the WMS Theater Department premiered its Spring Musical yesterday — Beauty and the Beast, Jr. — and it brought the house down! But there’s still two performances left — and you WON’T want to miss it. Check it out!